Data Flow Diagram (DFD) is the part of the SSADM method (Structured Systems Analysis and Design Methodology), intended for analysis and information systems projection. Data Flow Diagrams are intended for graphical representation of data flows in the information system and for analysis of data processing during the structural projection. By means of data flow diagrams it is possible to show visually the work of the information system and results of this work. Data Flow Diagram visualizes processes, data depositories and external entities in information systems and data flows connecting these elements. Data flows, indicating direction and character of data flowing in the considered information system. This variant of presentation of Data Flow Diagram objects got the name of Yourdon – de Marco notation. Data flows changes in external entities do not considered. Every diagram object should have a name. Each data flow is denoted with indication of transferred data and with the possibility of indication of the format of these data. Data Flow Diagram should not involve more than 10 objects, excluding arrows, representing data flows. In case of more complicated system the totality of several objects (as a rule, processes) is united and represented on the diagram in the form of one object. This complicated compound object is presented in the form of a separate flows diagram. Each component has a number, at this, diagrams illustrating compound objects are numerated starting from the number of an object which they describe. For example components of the diagram of the description of an object with number 5 will be numerated 5.1, 5.2 etc. Generally Process Flow Diagram depicts just the major equipment without details. For clearness there is a possibility to duplicate notations of used data depositories and external entities. Processes can’t be duplicated. For example if one the same data depository is used in several different processes it is better to duplicate it on the diagram but not to create several intricate data flow arrows from one object to several processes. This concerns external entities as well. Duplicates of data depositories are marked with the double line from the left side, external entities duplicates - with the asterisk. Data flows on the diagram can ramify and merge that implies branching or confluence of data in the information system. Thus the information system is represented by a planner in the form of the high level DFD in which objects are worked out in details by diagrams of the lower level with the preset level of detailed elaboration. There is also another way of looking at which all events in the system are described at once and each event is represented in the form of process transforming data flows, further these subruns are grouped for getting diagrams of the higher level. Great number of predesigned templates and samples give you the good start for your own workflow diagram or process flow diagram. ConceptDraw DIAGRAM provides you the possibility to use the grid, rules and guides. You can easily rotate, group, align, arrange the objects, use different fonts and colors to make your organizational workflow diagram exceptionally looking. Any information system receives data flows from external sources. In order to visualize them there is a list of data flow diagram symbols that describes how the system components cooperate. If you want to create a data flow diagram, ConceptDraw DIAGRAM v12 Solution Park has DFD Library that contains both Yourdon and Gane-Sarson notations. This figure shows the content of vector libraries, delivered with ConceptDraw solution for data flow diagram (DFD). There are three libraries composed from about 50 vector objects used to make data flow diagrams. They include a complete set of objects utilized by Yourdon-Coad and Gane-Sarson notations - two primary notations that are apply for data flow diagramming. Also, one can discover additional "Data flow diagram (DFD)" library that provides a data flow diagram elements for designing level 1 and context-level data flow diagrams. There are a lot of structured analysis and design technique methodologies used to describe systems and data sources. To visualize data structures, data flow diagrams can be used for various purposes in the area of software engineering. Nowadays these diagrams are also used in the area of business analysis and information system analysis. 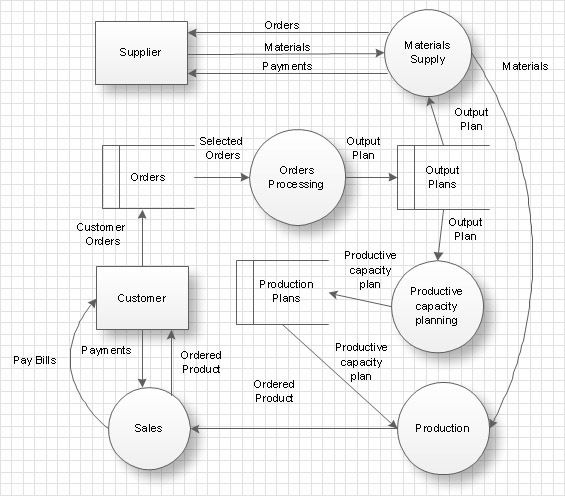 This data flow diagram depicts an account processing system of a typical account department of a small manufacturing enterprise. It shows the data transmission through the order processing to shipping verification. This data flow diagram was created according to standard of Yourdon and Coad notation. The vector graphic objects of Yourdon/Coad notation symbols was delivered by ConceptDraw Data Flow Diagrams solution. The current DFD can be employed as an example of a business process model, representing the set of business events and interactions commonly engaged in a accounts receivable process. A Data Flow Diagram (DFD) is a graphical technique which allows effectively model and analyze the information processes and systems. 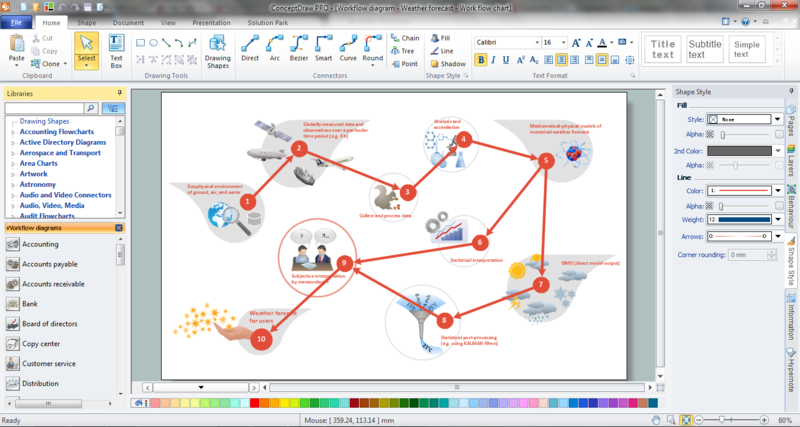 The ability to fast and easy create the DFDs is made possible with Data Flow Diagrams solution from the Software Development area of ConceptDraw Solution Park. For designing the Data Flow Diagrams are used simple DFD flowchart symbols which are connected each other by arrows depicting the data flow from one step to another.